Great news – Cacoo has reached 3 million users worldwide recently! One of those users is Adam Synnott, a software engineer and developer based in Sydney, Australia. He has been a Cacoo user for 7 years. 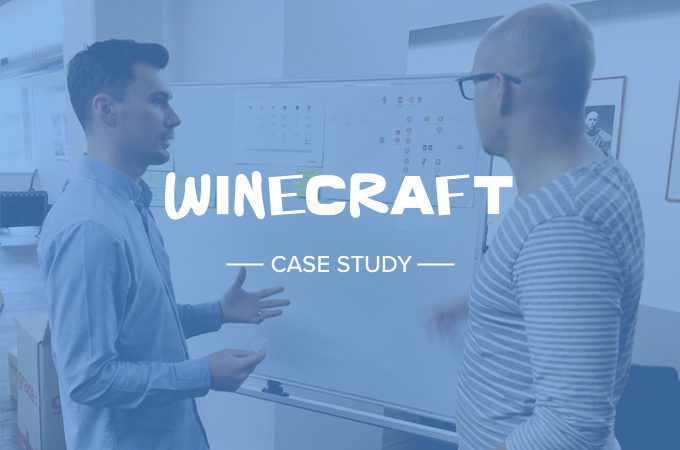 We did a phone interview with him to find out how Winecraft – the startup Adam works at – uses Cacoo for UML diagramming, work planning and communication. 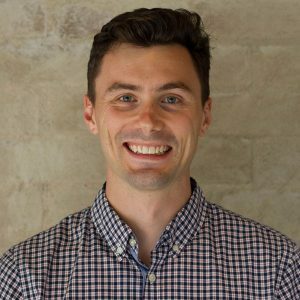 Adam Synnott – Tech Lead at Winecraft. Hi Adam, tell us about yourself. I’m a developer and software engineer. I’m currently working on a product called Winecraft. It’s a travel website; a startup product, and we just launched in June this year. Winecraft.com – a travel website for wine enthusiasts. Description: Winecraft is a travel website catering to the wine industry. It aims to change the way people travel to wine regions within Australia and the world. How did you find out about Cacoo? I started using Cacoo a very long time ago, about 7 years ago, for a university project. I’ve tried many tools, but I’ve never found anything really better. What other tools have you used in the past? I’ve used a few, but I don’t really remember, they just didn’t really work so well. Probably in the past, something like Powerpoint or Illustrator, but they’re not really diagramming tools in the same way that Cacoo is, so they’re not really a good comparison. So, years ago, you were already using Cacoo for your university projects. Yes, for a whole range of different things, probably at a very high level using it for UML (unified modelling language) diagramming. In software engineering, diagrams are a really great way to communicate your plans, what you’re doing, the systems and architecture. So, we were creating anything from UML diagrams, UML-style things and database schema diagrams (using Cacoo). I probably did a lot more UML in university than I do now. Winecraft.com’s network diagram created by Adam using Cacoo. Just wondering, from your university days till now, how often do people hear about Cacoo? Or was there any time when you introduced it to them? A lot of the time, people would ask, “Hey, how did you make that diagram?”, or “Where did you get that from?” Because Cacoo is easy to make great-looking diagrams, people often go, “Wow, that looks a lot better than the kind of crappy diagrams I make”. So, very often, I was the one introducing them to Cacoo. I can think of 50 people I’ve said, “Hey, I used Cacoo for it”, in the last few years. You introduced Cacoo to Winecraft too? What do you guys use Cacoo for? The main thing I use it for now is UML diagrams and cloud architecture diagrams where we got components working together in the cloud. It’s always good to document those, and use the diagrams for communication. I’ve also started to use Cacoo for our company process diagrams, because my role is also changing into a more operations-type role. 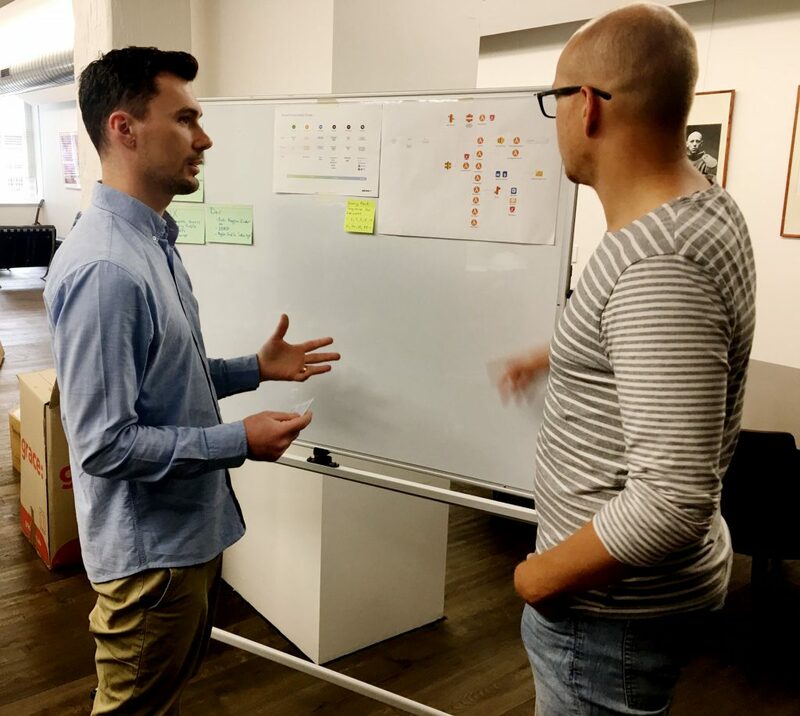 As for Teddy, our project manager, he uses Cacoo to create workflow-style diagrams, how users flow through the system, rather than documenting the system itself. Cacoo is really good for us to communicate with each other, for example our website: we’ve had a lot of trouble to get a really smooth way for users to sign up to our site, it’s really important for it to be as easy as possible so we don’t get people dropping off, so I can think of one time where me and Teddy collaborated on that in Cacoo, to say: the user does this, this is the screen that they see, then they receive an email, etc. From left: Adam, and Project Manager Teddy Moreau. Do you collaborate with Teddy using Cacoo? Yeah, we do sometimes. I don’t know if we’ve done any live collaboration, but certainly, we’ve shared diagrams back and forth, and the commenting feature in Cacoo is really, really helpful as well. Which other Cacoo features do you find helpful for your work? I think the inbuilt libraries: the ability to add new library of icons and shapes is very useful. 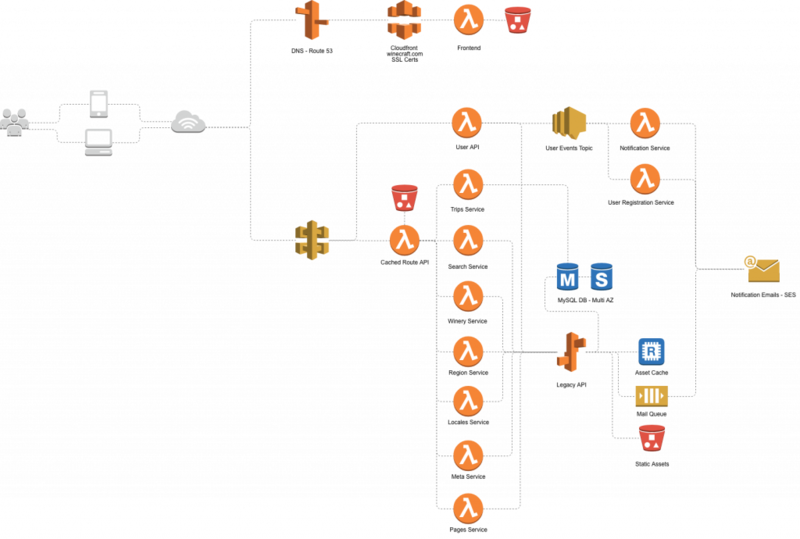 The one I use almost all the time now is the AWS library, there’s a lot of different options with the cloud architecture library which is really good. Being able to snap the lines to different shapes and just being able to move them around, and reorganise it as I need to, to create nice looking diagrams. There are other diagramming tools that are less aesthetically pleasing and do the snapping kind of thing, but I just really like the simplicity of Cacoo, the simplicity of design. Discover wine regions and create a perfect travel plan. Were there any steep learning curves when you started using Cacoo? Not so much, I think the interface is really very intuitive and for me, it was very easy to use. I can’t remember any time it was hard, just from recent experience. Teddy didn’t ask me any questions about it too. After introducing Cacoo to your team, what improvements do you see? It’s just a bit more clarity. For us to present our ideas and our plans much more clearly, and have them understood. That’s the main thing. This sounds random, but how many diagrams do think you’ve drawn using Cacoo? Hundreds… Since coming into Winecraft, in the last 6 months, I probably made 10 to 20 diagrams with multiple sheets, and then updated a lot of those as well. They’re often living documents, so when plans update, or I’ve made a change to the systems architecture, I update them. Thank you Adam for sharing with us. We wish you and Winecraft all the best – Cheers! Check out more Cacoo user stories. Soohian Soohian is a member of Nulab, the creators of Cacoo.